Citation Information: J Clin Invest. 2006;116(1):90-100. https://doi.org/10.1172/JCI26169. DC-based tumor vaccine research has largely focused on enhancing DC maturation/costimulation and antigen presentation in order to break tolerance against self tumor-associated antigens. DC immunization can activate autoreactive T cells but rarely causes autoimmune pathologies, indicating that self tolerance at the host level is still maintained in the vaccinated hosts. This study in mice reveals a novel regulatory mechanism for the control of self tolerance at the host level by DCs through the restriction of positive cytokine feedback loops by cytokine signaling inhibitor SOCS1. The study further finds the requirement of persistent antigen presentation by DCs for inducing pathological autoimmune responses against normal tissues and tumor, which can be achieved by silencing SOCS1 to unleash the unbridled signaling of IL-12 and the downstream cytokine cascade. However, the use of higher-affinity self peptides, enhancement of DC maturation, and persistent stimulation with cytokines or TLR agonists fail to break tolerance and induce pathological antitumor immunity. Thus, this study indicates the necessity of inhibiting SOCS1, an antigen presentation attenuator, to break self tolerance and induce effective antitumor responses. Persistent TLR stimulation of DC immunization failed to induce pathological autoimmune response and antitumor immunity. (A) TRP2-specific CTL responses induced by persistent in vivo TLR stimulation and DC immunization. C57BL/6 mice were immunized with TRP2-pulsed (100 μg/ml) and LPS-matured (100 ng/ml) DCs and then stimulated with various TLR agonists daily for 7 consecutive days. Splenocytes pooled from immunized mice (2–3 mice) were subjected to IFN-γ ELISPOT assays. An irrelevant peptide (OVA-I peptide) was used as a negative control. 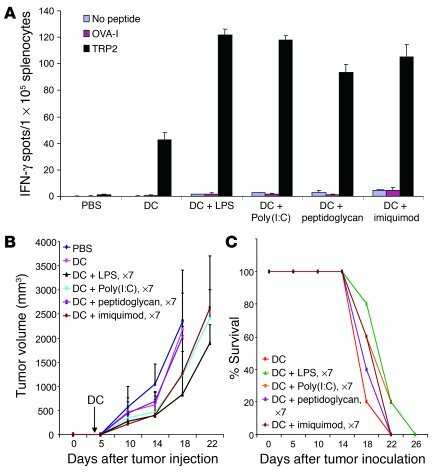 (B and C) Inability to control preestablished B16 tumors by persistent in vivo TLR stimulation and DC immunization. Groups of mice were inoculated s.c. with B16 tumor cells (2.5 × 105) and 3 days later were immunized via the rear foot pad with 1.5 × 106 TRP2 peptide–pulsed (100 μg/ml) DCs with ex vivo LPS maturation. After DC transfer, in vivo TLR agonists were administered i.p. daily for 7 days. Tumor growth and percent survival (n = 5–7 mice/group) curves represent 1 of 3 independent experiments. When their tumor volume reached approximately 2,000 mm3 in size, mice were euthanized and recorded as dead.